Years ago I was an enthusiastic member of the High Museum of Art, loved attending the member-only sneak previews of exhibits and enjoyed the opportunity to meet the Museum Director at special member events, not to mention just popping in for a stroll through corridors of incredibly talented artists. And when I could, I welcomed the company of friends who have an interest in art but would not otherwise visit an art museum...not without a little nudging. Now I'm back in Atlanta and the High is high on my list of places to visit regularly. 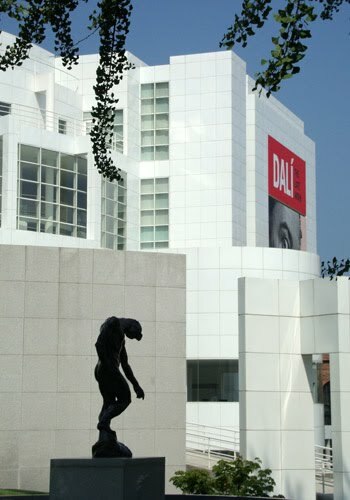 Today's High Museum of Art sells itself…the allure of its award-winning design, the $130 million expansion of three buildings and the high-caliber exhibits it offers continue to draw families, future artists and the art-curious. As soon as I figured out where to park (I easily found the Woodruff Arts Center parking deck immediately behind the museum, a block off Peachtree Street) I walked around to the "front" of the museum—where many years ago visitors entered. Well, a lot has changed! 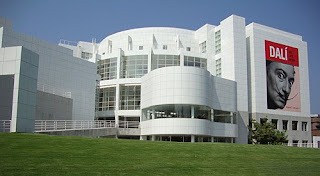 The main entrance is now in the "Sifly Piazza," the main courtyard of the Woodruff Arts Center, surrounded by the new, multi-story High Museum buildings, all donning the High’s signature brilliant white and clean line design. The admissions desk staffers were very professional and courteous. Chris, one of the admissions associates, helped me with general information, mapping out the museum and told me what benefits and discounts I would receive for supporting the museum with the purchase of a membership. As a supporter of the arts, I didn’t need much convincing, but it was nice to hear the excitement from a fellow enthusiast. I highly recommend picking up a museum map at the entrance. Mostly because the museum has grown substantially in size (approximately double what it was a few years ago) and galleries as well as collections and exhibits—you don't want to miss something you would find interesting, fascinating or inspiring, right? Getting around the High complex is easy. 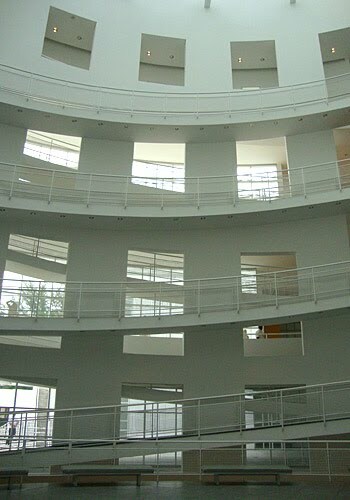 The museum's buildings are connected via glass bridges, which offer some eye-catching, unique views of the city's Midtown skyline. Each building also has a main entrance from the piazza. On display now, the "Salvador Dali: The Late Work" exhibit is quite remarkable. I've not seen such a collection of Dali originals since visiting the Salvador Dali Museum in St. Petersburg, Florida. The most exciting artifact in the exhibit (including paintings, jewelry, drawings and sculpture) was the painting "Santiago El Grande," which is at least 15 feet tall. Part of my fascination is that this is the first time the painting has been on display in the United States since its original 1957 debut. As in many Dali paintings, this piece also contains a depiction of his wife, Gala. The exhibit is on display through Sunday, January 9, 2011. Although there are many design esthetics I admire and appreciate, I'm particularly drawn to modern and contemporary design. The exhibit "European Design Since 1985" (now closed) was far more enticing, unique and well-beyond what some think of as current European design…which is a lot more than IKEA furniture and fixtures. And I want to go back to the museum to see the "Signs of Life: Photographs by Peter Sekaer" exhibit. At the High through Sunday, January 9, 2011, the exhibit depicts candid depression-era life in North America. The artifacts of the museum's more than 11,000 piece permanent collection are regularly rotated, but some of my favorites are seemingly on display continuously, which makes me quite happy. Particularly, I was on the hunt for "The Veiled Rebecca," one of the museum's many marble statues. Of course, mostly all fans of statuary recall the famous Michelangelo quote, "Every block of stone has a statue inside it and it is the task of the sculptor to discover it," but I remain in awe at the artistry it takes to create something so remarkably beautiful. As with most museums today, photography is permitted in the galleries housing the High's permanent collection (except where marked). However, photography in special exhibits, like the current "Salvador Dali: The Late Work," is not permitted. I committed a faux pas when I toured the exhibit "European Design since 1985" by snapping a few photos after which I was gently scolded by one of the security guards—who was of course properly doing his job. The piazza's shade trees, sitting areas and surrounding white and glass buildings offer an almost ethereal escape from the hustle and bustle of the city, as well as from the suburbs. The piazza also serves as a passage between the High Museum of Art buildings, should one find themselves not near one of the three enticing glass bridges. Also in the piazza is Table 1280, an artfully appointed restaurant and lounge, with delicious food and excellent service. I highly recommend including Table 1280 (blog post) as an option in your pre- or post-museum-visit dining plans. The museum also has other dining options. 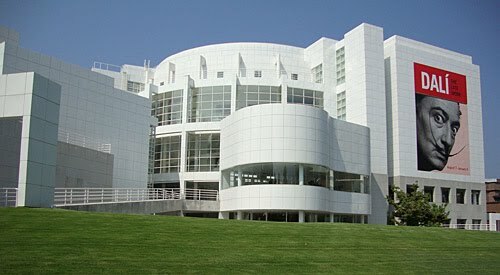 Will I visit the High Museum of Art again? I’m very much looking forward to it. On this particular visit, I toured for a couple of hours and still did not see all of the collections. I can hardly wait for the email or mailer announcing the next special event and new exhibit(s). I’m anxious to learn what it/they will be. Hours: Closed Mondays; Tuesday-Wednesday and Friday-Saturday 10 a.m. to 5 p.m.; Sunday noon to 5 p.m.
Tours: Docent-led 45-minute tours are offered Tuesday-Saturday at 1 p.m. and start in the Margaretta Taylor Lobby (the lobby level of the Wieland Pavilllion, at the main entrance); Family tours are offered by museum education staff on Saturdays and Sundays and begin in the Greene Family Learning Gallery in the Stent Family Wing (the building facing Peachtree Street). Parking: Parking is available in the Woodruff Arts Center (members can receive a discount) for $3.75 per hour, a maximum of $12 daily during the week and $12 for weekend evening special events. Accessibility: The museum’s buildings, restrooms, exhibits and tours are provided for groups with sight, hearing and mobility challenges. Limited parking for people with disabilities is available in the Woodruff Arts Center Box Office lane off Peachtree Street at 15th Street. A handicap drop-off is also available on 16th Street.